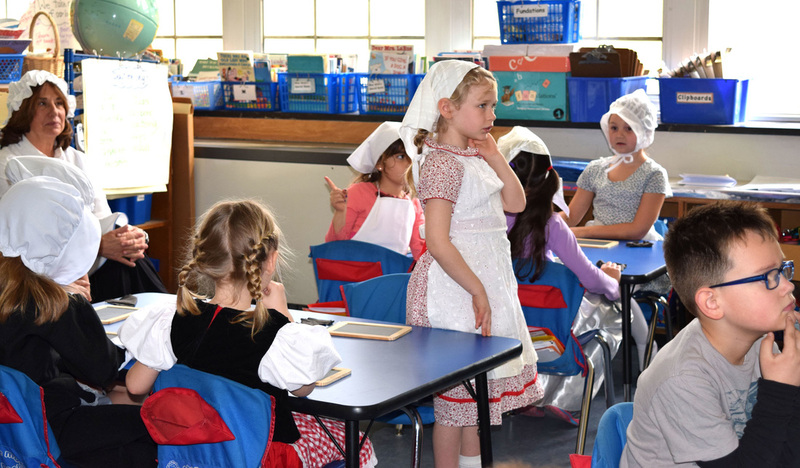 The first graders of Glenwood Landing have been immersed in a Social Studies Unit, School Life Long Ago. First Grade Teachers in conjunction with the GWL Collaboration Team, comprised of the librarian, Enrichment Specialist, music, art, and physical education teachers developed a unit of study revolving around the CCLS, the new Social Studies Standards, and Social Studies Understandings., Time appeared to stand still as Glenwood Landing teachers came to school fully dressed as “School Masters” from “School Long Ago” and their students could be seen in elaborate garments from the 1800’s! 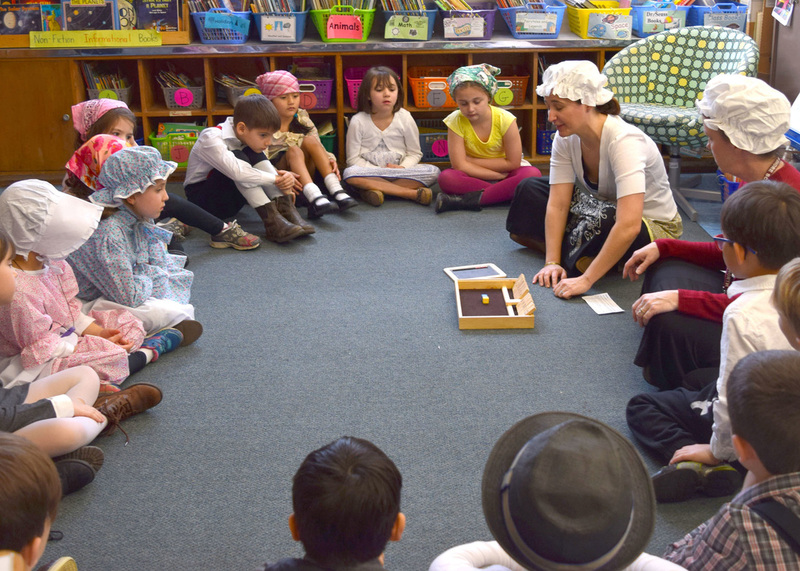 On March 10, 2016, the first graders rotated to various hands-on workshops throughout the day to get a glimpse of a typical school day long ago. 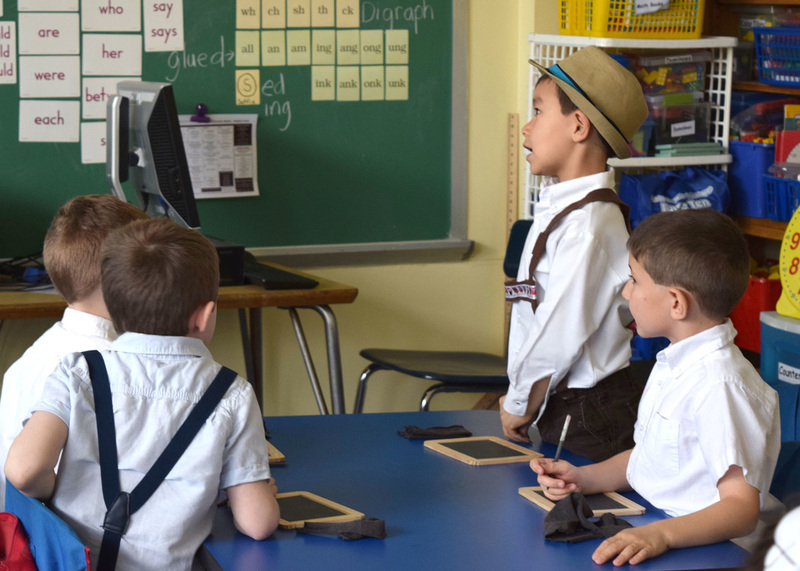 At Glenwood Landing School, this hands-on educational experience enabled the first graders to duplicate lessons from many years ago utilizing similar tools and teaching methods. To practice their penmanship, students were given a slate and a slate pencil. In addition, mathematical skills were practiced utilizing a math game called ‘Shut the Box,’ while students played with an old-fashioned ‘Cup and Ball’ held together by a string to practice their hand-eye coordination. They were reminded how strict the classroom environment was and how all of the children had to be attentive and respectful to their teacher in the one-room school house. Often they had to sit up straight and behave during the whole school day, approximately 8 am to 4 pm. If they did not, they might have to sit in the corner with a dunce cap! In addition, over the course of the week leading up to the day, as students went to their art, music, gym, and library classes, each child engaged in a series of interdisciplinary lessons to further deepen their understanding of the time period and foster critical thinking skills. In addition, first graders will journey to the one-room school house built to replicate the one in Glenwood Landing located today on the North Shore High School campus. Many thanks to all of the Glenwood Landing students and their teachers who participated in these authentic interdisciplinary lessons from “School Long Ago.” Please be sure to ask your children all about these incredible learning experiences.